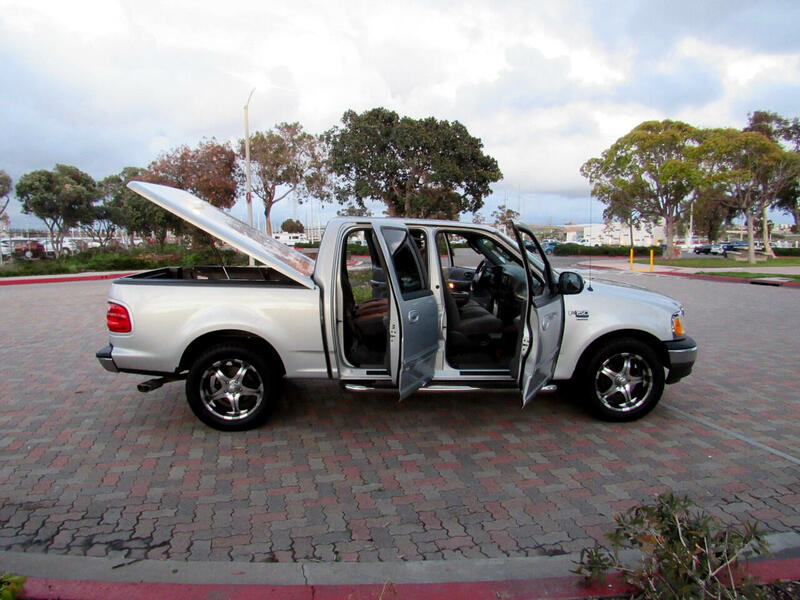 Beautiful Southern California Luxury Crew Cab Truck w/Automatic Transmission w/Overdrive, PS, Cold AC, Powerful yet Economical 4.6 Liter Triton V8 EFi Engine, Low Mileage, Luxury XLT Model, Tilt Wheel, Cruise Control, Power Windows, Door Locks & Mirrors, Multi-Function 'Power Acoustic' AM/FM Stereo Sound System /CD/MP3 Player, Bluetooth Phone & more, Practical Split Front Bench Seat w/Retractable Center Console/Middle Seat w/Seatbelts, Fold-Down Split 70/30 Rear Bench Seat, Factory Sliding Rear Window, Quality 'Snug-Top' Locking Fiberglass Rear Bed Cover, 'Rugged Liner' Bedliner, Custom Rear Chrome Dock Bumper w/Frame-Mounted Receiver Tow Hitch Assembly w/Electronic Trailer Brake Assist, Premium 20" Alloy Wheels w/Matching Set of Quality Goodyear 275/55R 20" 'Eagle LS-2' Radial Tires, 'Bully' Side Protective Chrome Running Bars, Retractable Rear Cupholders, Custom 'Billet' Grill & more; Nice Truck!! Clean CARFAX Vehicle History Report w/Service & Maintenance Records; Excellent Value at Just $5,975/Best; Financing Available; Trades & Credit Cards Accepted; For more information please call Kevin at (619) 985-6527; FAX (619) 765-2321; To view more pictures and/or to apply for financing on-line please visit our website at www.presautoinc.com ... For fastest response and best service please call Kevin at (619) 985-6527. Thanks.